After the removal of our old garage, we ended up with a giant hole which needed to be filled in our garden. Luckily, one of our friends had some soil that they were wanting to get rid of! We decided to hire a piece of equipment for the job – it would have taken more time than we had to move it with a wheelbarrow, not to mention ruining our bodies. It claimed to fit through doorways, and it did. The first time was a bit scary though! We ended up with less of a hole! We plan to turf it in the near future. It looked slightly better, I thought that the ground would level itself out with 2 tonnes of car on it. It didn’t. Instead, it made it even worse! Now that it has stopped raining for more than two days consecutively, we can finally get back out into the garden. All of our tools are still nice and dry as the temporary garage roof fixes are still holding – even with the recent storms. In order to fix the drooping garage wall, this bed has to be stripped. You can see the prefab panel closest to the door is sliding into the ground! It turns out that there are no foundations for any of the garage. We got to work sorting it out. This is actually the first bed that we have worked on since living at our house – we needed to wait at least a year to see what kind of growth we would have. Nothing too much in this particular bed – mostly daffodils (we have hundreds in the garden) and some climby, woody thing. All in all, the job didn’t really take too long. The shredder ate most of the waste, and into the green bin it went! We are going to head back out to get any plant remains that we may have left. Also, we found out that the bed isn’t quite as long as we thought, it has mostly just spilled over onto the concrete. Looking forward to sorting out some more of our beds before the spring! 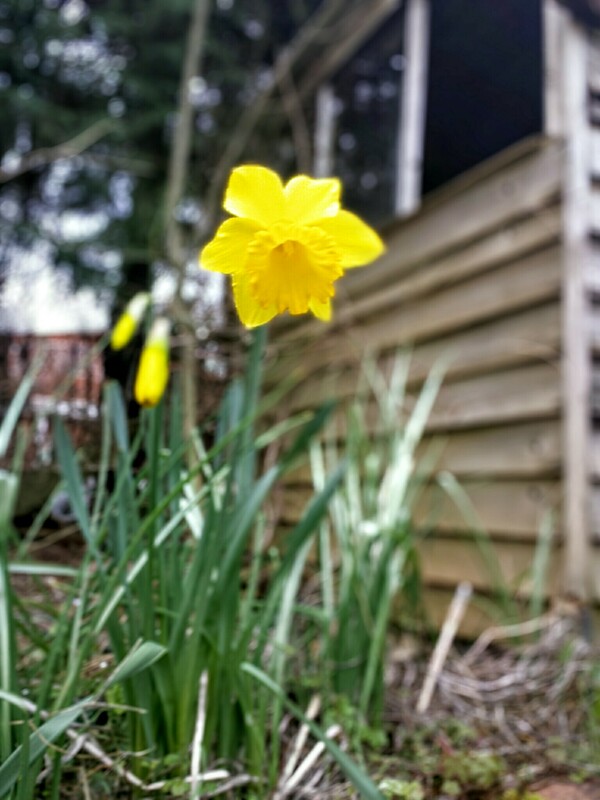 First daffodil of the year.